One thing James learned during his fight was that spending time with other cancer patients was an incredible way to build strength and spirit to help maintain the courage to continue fighting through the grueling cancer treatments. Because of this, TOKC provides activities and opportunities for pediatric cancer patients to socialize, enjoy events, and bond with those who know what being a kid with cancer is like. Early detection greatly improves the survivability of pediatric cancers, but because they are uncommon, and because their symptoms are often similar to other symptoms children have like athletic pains, growing pains etc., it is easy for pediatric cancers to go undiagnosed for quite some time. Therefore, TOKC provides education about the signs, symptoms and diagnosis of various pediatric cancers. We believe that by promoting early detection, we can make a meaningful and immediate impact on survivability rates while growing the community of people who take an interest in the cause of curing pediatric cancers. Every two minutes a child is diagnosed with a Pediatric Cancer. In 2006, 13-year old James A. Ragan was one of those children. Over the course of the next 7 years, James underwent a grueling treatment regimen of chemotherapy, surgeries, radiation, and experimental drug trials. The protocols and drugs used in his treatment have seen little improvement in decades, and with only 4% of federal research funding going to pediatric cancer research, James saw firsthand the effect of the critical funding gap for research into pediatric cancer. From 2006 onwards, James dedicated the remainder of his life living to raising awareness and funds for this cause. He and his sister Mecklin realized they needed to make a greater impact and fill that desperate need; so in 2010, they along with their carefully chosen Board Of Directors, formed the Triumph Over Kid Cancer Foundation. 2010: TOKC’s first pledge project to raise 1.5 million dollars to fund the children’s sarcoma initiative – a pool of money administered by doctors at M.D. Anderson and TOKC board members which would fund new research projects focusing on pediatric cancer. As part their agreement, M.D. Anderson decided to match the 1.5 million dollars with 1.5 million dollars of its own money to also fund pediatric cancer research. 2013: TOKC met its 1.5 million dollar goal which was Matched Dollar for Dollar by M.D. 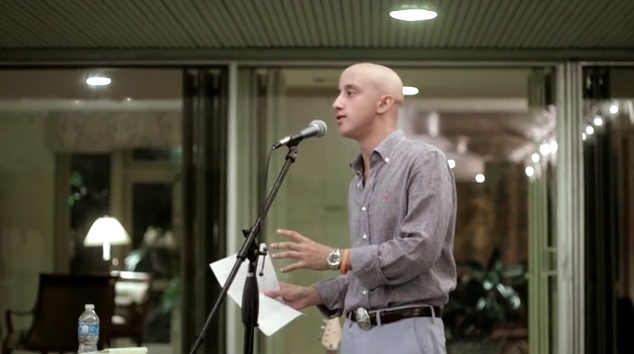 Anderson, but on February 17th of 2014, shortly after finishing the Children’s Sarcoma Initiative, James passed away. 2014: In spite of everyone’s pain and sadness, instead of giving up, TOKC pushed forward and started the James’ Wingman Program. Each year we adopt a cancer kid to be the face of pediatric cancer for TOKC. A child who reminds us why we do the work that we do. TOKC embarked on the Genomic Research and Sequencing Project for Pediatrics or GRASP. It is the only longitudinal whole genome sequencing project for pediatric cancer. TOKC pledged 1.5 million dollars to the project with MD Anderson matching those funds. 2017: TOKC completed the GRASP $1.5 million pledge which was Matched Dollar for Dollar by M.D. Anderson, and today they are compiling longitudinal whole genome sequencing data on several pediatric cancers. Researchers can use that data to advance their understanding of pediatric cancer and develop more effective treatments. Pledge to raise 1 million dollars to fund a phase 2 drug trial at M.D. Anderson for a drug whose original research was funded by the Children’s Sarcoma Initiative. So for us, it’s exciting to see work that we funded result in actual new drugs to treat children with cancer. A new immunotherapy drug being developed at Texas Children’s Hospital. Immunotherapy has shown promise in treating many adult cancers and we are hoping to make similar gains in pediatric cancers. The Triumph Over Kid Cancer Foundation is changing the landscape in the fight against pediatric cancer. 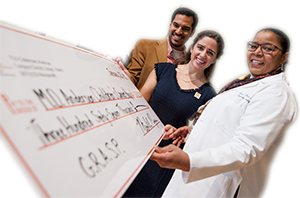 Not only has our grass-roots organization raised over $3 million dollars for pediatric cancer research, and those funds have also been Matched Dollar for Dollar by M.D. Anderson, it has also increased awareness of pediatric cancer leading many other groups to join the fight for increased funding for pediatric cancer research.